However, if you are only interested in seeing the tulip fields, you don’t necessarily have to go to Keukenhof gardens. 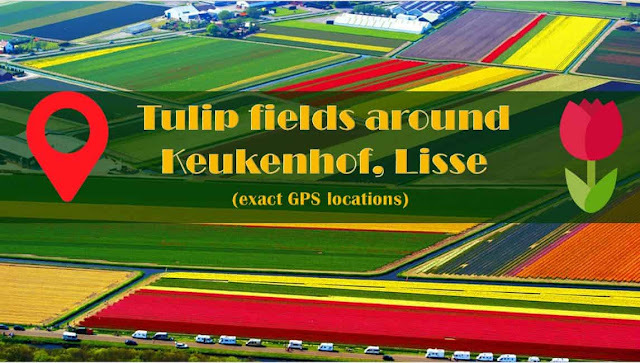 There are several colorful tulips fields around Keukenhof – Lisse area. But how do you navigate to these fields? I looked for address/location coordinates all over internet; but there was no luck. So last year, I decided to explore the entire area myself and marked a few beautiful location coordinates. Hope this may be useful to those who are interested. How to reach tulip fields by bike? The best way to see the tulip fields around Lisse is probably by bike. You can either bring one yourself or rent one at the main entrance of Keukenhof. There are several route options, often referred as "Bloemenroute" – you can download a map from here. How to reach tulip fields by car? You can also explore tulip fields by car. In general, the entire state highway N208 around Lisse are filled with multi-colored tulips, hyacinths, and narcissus (Daffodils). Below is the route I explored and have marked a few most beautiful field locations here, with map street views. Tip: You may park your car at the “Tuincentrum Overvecht” for free and walk towards the fields. Tip: It’s just behind the “Tuincentrum Overvecht” , leave the car there and walk to the fields. Tip: No parking site nearby; you may leave your car/bike on the edge of the road. It’s not a busy road to worry about parking. This is a beautiful area, surrounded by fields of many different colors of tulips, variety of hyacinths, and narcissus , and also very close to Keukenhof gardens. 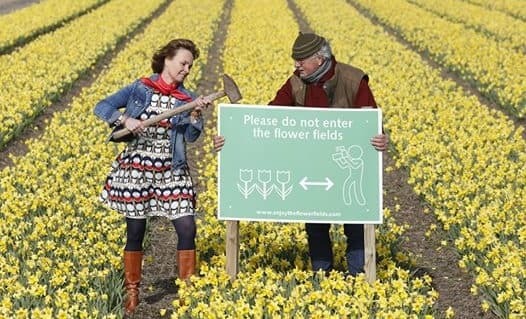 Please do not enter the fields!. By we walking through the fields, we are not only breaking a few flowers, but also spread sickness to the flowers. These flowers are farmers’ hard work, let’s not spoil them. At certain period (typically 3rd / 4th week of April when the major 1st corps are done), some of the farmers will be kind enough to let you into the fields and may even click photographs for you. During this time, there will still be good amount of beautiful flowers. I marked these location coordinates last year (Apr 2018). But assuming that these fields are traditional and don’t change much within an year, I hope you’ll find them at the same coordinates this year too. Hope you found this post interesting and useful. If you enjoyed it, please share & subscribe. Drop your questions below, I'll be glad to answer. Thanks!